You don’t need to be of noble standing to dress like a proper lady when you head to the Renaissance Faire. You don’t even need to be going to a festival; you can sport this elegant Medieval Laced Gown for any occasion you fancy! Imaging going for a stroll through your village on a lovely sunny day, with the birds chirping and the breeze blowing through your hair. Everywhere you look, the villagers are hard at work tending their gardens, smithing metal into useful things, and entertaining at the local tavern, but they all stop as you pass by to respectfully tip their caps and render a cheerful “Good day, m’lady!” Sounds like a pretty great way to spend an afternoon! Whether you’re spending this fine day at your favorite festival, or you’re simply out for a fanciful walk through the park, wearing this lacy gown will show everyone your love for dressing ladylike when you’re out and about. 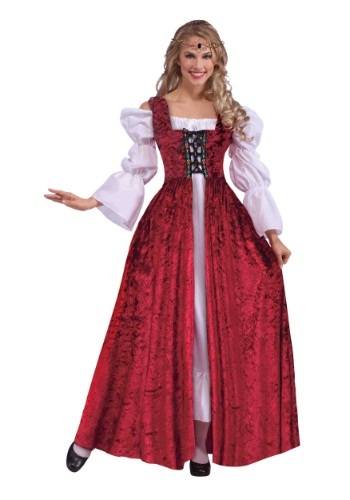 This cute corset style gown resembles the kind of fashion that was all the rage in medieval high society. The bold red crushed velvet skirt and bodice drapes over your shoulders and laces up, showing off whatever style garment you decide to wear under it. Choose a frilly underskirt with puffy sleeves for a glamorous and voluminous look, or a simple flowing chemise for a more subtle fashion. Add a pair of slippers and a hair ribbon to complete your noble ensemble, and you'll catch all the lords' eyes!